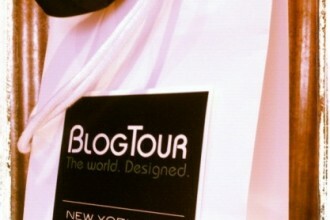 A bigger BlogTourNYC goodie bag may be needed! Yesterday I chose some products that I would like to see in an imaginary goodie bag from some Blog Tour NYC sponsors. After their generous sponsorship none of us attending Blog Tour are expecting anything from the sponsors – but it was great fun to review their entire ranges. Today we are focusing on the other sponsors. Largest item into the goodie bag first so the first featured sponsor is Poggenpohl. 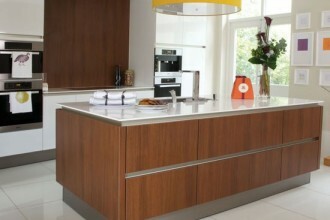 As a huge fan of the handleless kitchen I am spoilt for choice here. 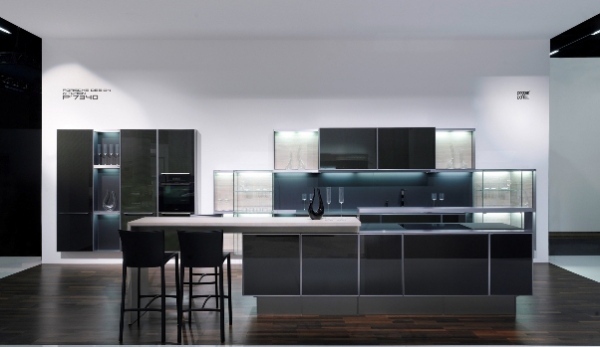 The P’7340 is the range chosen, it is the first kitchen range in the world to feature carbon fibre for the doors. 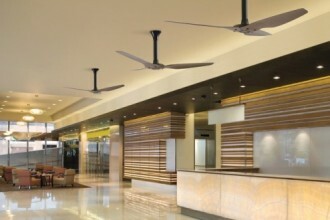 Stunning design! The next featured sponsor is Victoria + Albert, and this is an easy one. I love their new Edge range so we are putting the bath into the goodie bag. Recently launched, this range has distinctive cubic styling and given the size is perfect for compact bathrooms. 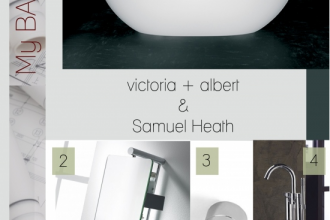 Samuel Heath has one of the finest heritages of all brassware companies. I have been a fan of their range for many years but it doesn’t make choosing any easier. We are going for some glamour here with the Fairfield range of brassware – with crystal levers. Arts and crafts inspired and pure class! The next item for the goodie bag is from sponsor Jenn Air. 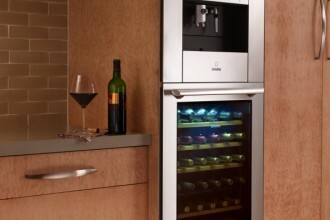 The Pro-Style range is perfect if you like to entertain. 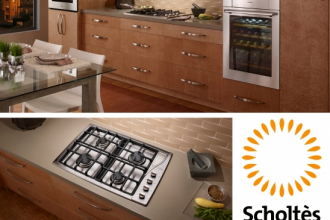 With two ovens and a large hob you could certainly cook for a crowd with this appliance. Every home needs good art and the next featured sponsor Spirit of Sports has a great range. As a keen swimmer I am choosing this print, Take the Plunge. Whatever your favourite sport you will find something in the Spirit of Sports collection. 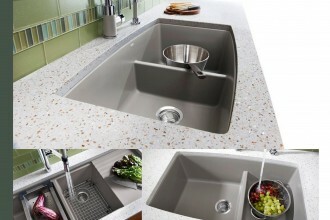 Choosing from the Modern Aire range isn’t very easy as it is so extensive – and they will also make whatever you want. One of my favourite products is a cooker hood finished in oil rubbed bronze. This would certainly add some wow factor to any kitchen. The final sponsor featured, Ethan Allen is also the most recent one to come on board. Here we are going for glamour with an elegant side table. 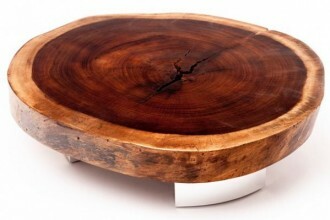 Designed with a hint of nostalgia the table is timeless and would fit into any style of interior. The goodie bag is now full, well overflowing – I am not sure how I could get it home! This is just a bit of fun, but a great way to learn about the product range of each sponsor. Personally I want to thank all the sponsors for making it possible for me to go to New York next week – it is going to be an amazing trip! Thank you Blog Tour NYC sponsors. After years working in the corporate world, Andrew Dunning left the City to follow his true passion of Design, so he retrained in interior design and launched APD Interiors in 2004. The brand was launched with one aim: to allow people to have their dream home for an affordable price as Andrew firmly believes that good design doesn’t have to be expensive. Since then the business has gone from strength to strength, Andrew has been featured in the Evening Standard, he writes a regular column for the London CityAM newsletter, and he contributes to the Rightmove.com blog. In addition APD Interiors also has its own blog providing regular interior design tips and ideas and Andrew provide daily twitter tips to his 8,000 followers. Keeping an eye on comfort and practicality, while combining contemporary and traditional forms in projects, has seen APD Interiors win numerous commissions and praise from their clients. APD Interiors provides a design and build service to all its clients, aiming to take away all the headaches as they guide them from the design through planning to delivery. Current projects include a full house refurbishment in Islington, a glass box extension to a Grade II listed house in Central London and a budget bathroom in Crouch End. Each project offers different challenges but the objective remains to deliver cost effective design and build to all APD Interiors clients.